A shrewd movement strategist, Fannie Lou Hamer rose from abject poverty to reshape the American political order. Fannie Lou Hamer traveled a long way out of the Mississippi Delta to the center of the stage at the Democratic National Convention of 1964. In Atlantic City, Hamer implored the nation to witness the violence she endured for exercising her right to vote—and in the process, helped force one of the most dramatic shifts in the U.S. political order since the Civil War. The youngest of twenty children, Hamer began picking cotton on a sharecropper plantation at the age of six. In 1961, she was involuntarily sterilized when a white doctor surgically excised her uterus. The next year, when the civil rights movement came to Mississippi, Hamer was personally recruited by the Student Nonviolent Coordinating Committee’s field secretary, Bob Moses, to build a mass base of autonomous local organizers that would become the Mississippi Freedom Democratic Party. While returning from a voter registration workshop in 1963, she was arrested in a bus station, thrown in jail, and cudgeled, leaving her with permanent kidney damage. And in Atlantic City—out of the Delta, out of prison, out of poverty—Hamer led a delegation of poor, rural African-Americans to the DNC to realign America’s political parties. October 6th marks the centennial of Hamer’s birth. She is remembered for her outspoken moral courage (“I’m sick and tired of being sick and tired” has traveled from epitaph on her gravestone to epigraph of working-class exasperation), her magnanimity, and, whenever morale waned, her impassioned renditions of the spirituals “Go Tell It On The Mountain” and “This Little Light of Mine.” But her own charisma might overshadow her deeper contributions to the movement. Her commitment to voter registration and her personal philanthropy as an anti-poverty worker in Mississippi later in life are well known. But by taking advantage of the crumbling political order to win enfranchisement of African-Americans within the Democratic Party, Hamer proved to be one of the most brilliant strategists of the civil rights movement. On the 100th anniversary of her birth, it’s worth examining how today’s left can learn from this overlooked part of her legacy. While “seat the Freedom Democratic Party” rang out across Mississippi at rallies ahead of the showdown in Atlantic City in the summer of 1964, gaining seats at the DNC was only a corollary to the movement’s—and Hamer’s—broader goal. The hubbub surrounding the national convention gave the MFDP a rare opportunity to force America’s attention onto the plight of poor black Mississippians. Since the “regular” Democratic Party in Mississippi was composed of racists utterly opposed to African-American participation in politics, Hamer took her struggle national. The MFDP wanted nothing less than the expulsion of the racist Dixiecrats from the Democratic Party. Hamer and her crew succeeded, stirring the realignment in America’s electoral map that had been brewing since the New Deal. Today, Donald Trump and Bernie Sanders are harbingers of another realignment. By looking to Fannie Lou Hamer, movement organizations on the left can seize this uncertain political moment to build a multiracial working-class faction to transform the Democratic Party. Even as the civil rights movement reached its peak, Southern white supremacist legislators known as the Dixiecrats—or Southern Democrats—enforced segregation in their states with lethal force. Jim Crow was so absolute in rural Mississippi in the 1960s that the forty-year-old Hamer did not know that voting was her constitutional right until the day Moses invited her to join SNCC. African-American men had won suffrage with the passage of the Fourteenth Amendment after the Civil War, yet in 1963, Mississippi —and the lowest percentage of blacks who were actually registered. According to data required by the Voting Rights Act of 1965, Mississippi denied the right to vote to 94 percent of its half-million eligible African-American citizens. In addition to lunch counter sit-ins, then, voter registration was a powerful tactic in challenging white supremacy. Hamer accepted Moses’s invitation into SNCC to spread the gospel of voter registration and inform black residents across the South of their constitutional right—which, invariably, was illegally and violently denied by local and state Dixiecrat authorities. 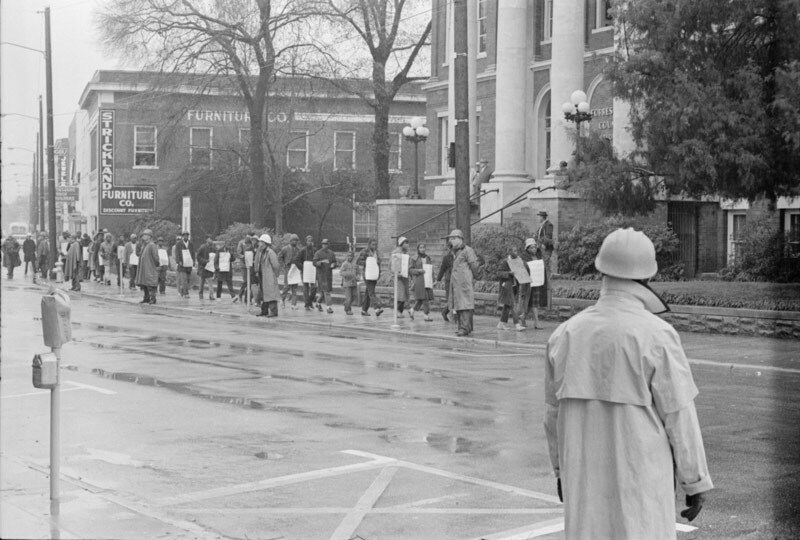 Fannie Lou Hamer, in hat with placard, leads a “Freedom Day” voting rights march in front of Forrest County courthouse, Hattiesburg, Mississippi, January 22, 1964. 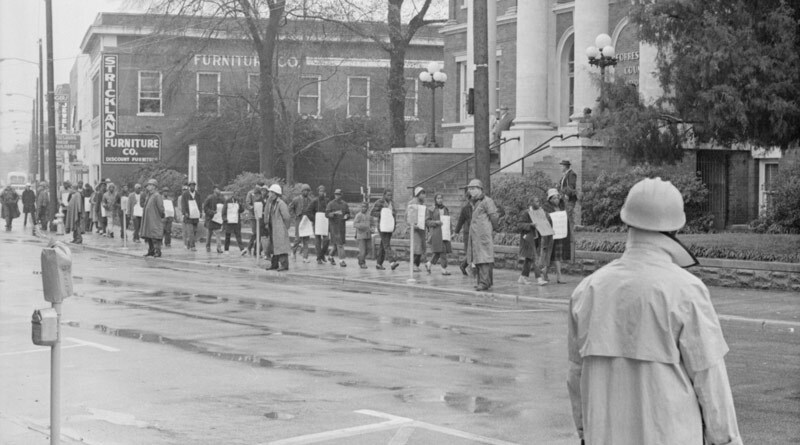 The SNCC campaign sought to register hundreds of African-Americans in the county to vote, at a time when not a single black person was registered there. Courtesy of the Mississippi Department of Archives and History. But the federal government itself was hamstrung. Democrats held a majority in both houses of Congress in the early 1960s under President Kennedy, and yet advanced no major federal action on civil rights. Kennedy himself was only a lukewarm supporter of full enfranchisement, in large part because he had to placate the Southern faction of his party—the Dixiecrats. Democrats had long been the only viable candidates in the South, still carrying the mantle of resistance to the Republican party of Lincoln. These Dixiecrats were some of the most fervent segregationists in power. The Senate’s seniority rules meant Dixiecrat members were the bottleneck of the chamber’s bills. This procedural technicality became known as the “Southern Veto,” giving senators from former Confederate states enormous power to dictate which legislation moved forward. If there was any hope for a federal law guaranteeing the right to vote, Hamer and other movement leaders concluded, it flickered and flared with the power of the Dixiecrats. The dual parties of the United States forces uneasy coalitions. Unlike the parliamentary systems of Europe, which allow for smaller and more ideologically stringent parties, the winner-take-all nature of the American federalist government creates unsteady armistices between groups who must foist the same banner. The Democratic Party of the early 1960s counted among its members both “segregation forever” white supremacist George Wallace and civil rights ally Hubert Humphrey. If organizers could cleave the Dixiecrats out of the coalition of the Democratic Party, the segregationists’ power might wither, opening space for Democrats to champion civil rights. A challenge to the Mississippi Dixiecrats, made on the floor of the DNC, would serve as a dramatic moment on the national stage to showcase the violence and indignities African-Americans weathered for the vote. Hamer and her fellow organizers intended this spectacle to force a crisis of conscience within the Democratic Party strong enough to expel the Dixiecrats and so loosen their stranglehold on federal legislation. The floor challenge was thus birthed as a strategy to polarize the majority of the Democratic Party to the side of the movement. The strategy of targeting the Mississippi Democratic regulars developed out of their already tenuous relationship with the national party. A DNC committee ruled that delegates must pledge an oath of loyalty to the president in order to be seated. In rebuke, Mississippi Democrats ratified a plank at their state convention in opposition to civil rights and to the national Democratic Party platform. The MFDP forced the question: If white supremacists could not be counted upon to support their party’s nominee, what were they doing in the party in the first place? The Democratic National Convention was the perfect stage to gouge open this rift in the party. “If you seat those black buggers,” Texas governor John Connally warned President Johnson, “the whole South will walk out.” That was, of course, the point. The South, however, was one step ahead. The Dixiecrats were already reeling from the passage of the Civil Rights Act weeks before, which had been forced through the Southern Veto after months of procedural jiujitsu and a burst of public outrage over the deaths of Freedom Summer activists in Mississippi. The mere prospect of Hamer’s challenge was affront enough for the regulars to pack their bags. On the official opening of the convention, Hamer and the Freedom Democrats muscled their way to their rightful place—presumably hoping to put on display the stark contrast between their own majority-black delegation and the lily white racists. Instead, they found the seats abandoned. In November 1964, President Johnson lost Mississippi, Alabama, Louisiana , Georgia, and South Carolina, all former Confederate states that had last elected a Republican nearly a century before. * These states have rarely chosen a Democratic candidate for president since. That day in Atlantic City, then, marks when fortunes diminished for the Democratic Party in the Deep South. This realignment, however, did not achieve the MFDP’s deeper goal of building a multiracial, working-class democracy, and today that dream seems further out of reach than ever. The movement won a crucial victory in casting African-Americans as key constituents and stakeholders within the Democratic Party—an institution to which they remain loyal to this day. But, booted from their former home, white Southerners were not exiled to the political wilderness. They were courted by the dog-whistle racism of an opportunistic Republican Party. With Nixon’s “Southern Strategy” and the Reagan Revolution, the realigned Democratic Party confronted decades of conservative revanchism, culminating in the election of Donald Trump. The scrambled outcomes of last November suggest we’re now approaching a new electoral order. The general structure of this still unrealized realignment appears to be between top and bottom, elites and populists, establishment and insurgents. But its substance remains murky. One possibility seemed to lie in the economic nationalism of Steve Bannon—a white supremacist welfare state that would likely resemble apartheid South Africa. This was the rancid populism that Trump largely ran on, though Bannon’s ejection from the White House, as well as the president’s corporate safe space of a cabinet, makes this look increasingly unlikely. Bannon-style populism found an easy opponent in a Democratic Party that, in recent years, has been all too prepared to discard working-class whites for suburban soccer moms. Though this “Panera Bread strategy” of courting disaffected Republicans failed both Hillary Clinton and Jon Ossoff, its legacy lives on in the rehabilitation of neocons like David Frum as members of the #resistance. Though the Democratic narrative of “A Better Deal” bolsters the party’s populist bona fides, it’s still possible that revulsion at Trump will spur a mass defection of Republicans into the open arms of Democrats—and that Democrats will take pains to embrace them when they could be rebuilding their working-class base. Here, the GOP falls to infighting between nationalists and scions of small government while the Democrats cling to power as the party of a cosmopolitan professional class and business elite. A few days after the 2016 election, political scientist Lee Drutman suspected this to be the likeliest scenario, and it remains a major temptation for the Democratic leadership. Both of these possibilities would be disastrous for the left—and for the American public. But Fannie Lou Hamer teaches us that we are not powerless in the face of an uncertain political landscape. With the right strategies, we can shape the direction of the nation’s shifting allegiances to make real the promise of multiracial, egalitarian democracy. For all of its flaws, the Democratic Party of today isn’t hampered by a group of open white supremacists among its ranks. The slow hemorrhage of white voters out of the party—without a concomitant expansion of geographic voting power—makes expelling still more members of the party a poor aim for organizers today. Instead, the left must draw the working-class voters (and non-voters) disillusioned by the ravages of neoliberalism back into the Democratic Party. A geographically and demographically diverse working-class coalition of whites who flipped from Obama to Sanders to Trump as well as the people of color disenfranchised by GOP voter suppression could mount a hardy challenge to the Democratic elite—and to Trumpism. A campaign to this end must resist the ideological dilution of the party by so-called Republican moderates more distressed by Trump’s boorishness than by his racism. It shouldn’t hesitate to encourage the further splintering of the GOP by tapping into the populist anger that drove Trump to victory in the Rust Belt. But above all it must focus on unleashing the voting power of the young Americans of all races who feel they have no stake in the current system. This would build on the Sanders insurgency; the Working Families Party’s effort to shift the Democrats left from the bottom up; and social movements like those fighting for black lives, immigrants’ rights, and climate justice. Most crucially, it must activate the “New American Majority,” the latent multiracial coalition of progressive voters disengaged from a political system that ignores them. It’s no coincidence that the Steve Phillips, one of the writers advancing the paradigm of the New American Majority, commissioned an appraisal of how poorly the Democrats reach out to voters of color. He called it the Fannie Lou Hamer Report. 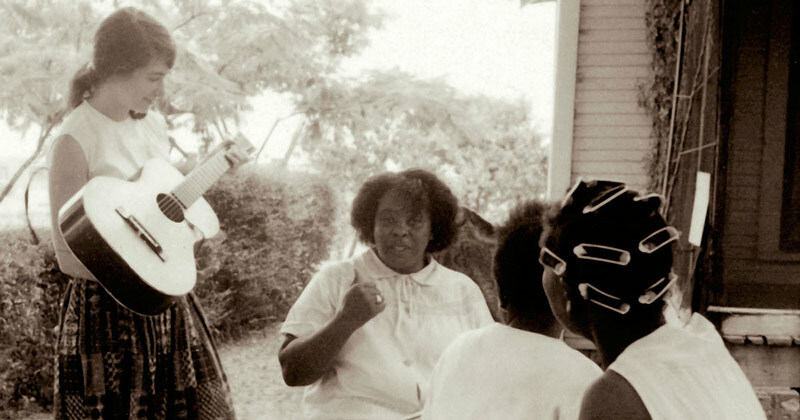 Fannie Lou Hamer and fellow SNCC activists during the Mississippi Freedom Summer campaign, 1964. Courtesy of Wallace Roberts / Jewish Women’s Archive. Indeed, the most important lesson the left today can take from Hamer is carrying on her legacy on the vanguard of voter-registration campaigning. Movement groups outside the power structures of the Democratic Party need to build voter bases and mobilize them to turn out for their preferred candidates. The Clintonian centrism dominant among Democrats since the 1990s alienated progressives from the party as an apparatus of power. But spurning elections (or potentially sympathetic elected officials, as in Occupy’s 2011 rebuke to John Lewis) has been disastrous. Third-party spoilers have dealt many a blow to progressive causes. This is contempt for political reality. By contrast, Hamer imagined herself exercising her vote to kick “people outa office that I know was wrong and didn’t do nothin’ to help the poor.” To make her dream a reality, she joined SNCC in registering African-Americans across the South to contest for space within the Democratic coalition. The irony is that the doors to representation for black Southerners were viciously guarded by the most regressive of Democrats. But SNCC turned this to an advantage. Brutal disenfranchisement was an affront to the principles this nation was founded upon, as Hamer displayed for Americans across the country, and should not be tolerated by the public. By organizing registration drives and holding their own parallel primaries, SNCC activists demonstrated just how many African-Americans would vote if given the chance. They offered the Democrats a powerful constituency—if the party took seriously their demands. Likewise, it was only when Bernie Sanders decided to run as a Democrat against the establishment that young people felt empowered within a system they associated with saddling debt. The party today would be wise to treat this influx of millennials better than how Johnson treated Hamer in Atlantic City—with two restricted, non-voting seats. This work the MFDP put in to register voters within the Democratic Party suggests a subtler lesson we can learn from Hamer: coalitions arise from necessity, not ideological cohesion. There’s a reason Mississippi locals organized as the Democratic Freedom Party and not the Republican Freedom Party—the Republicans lacked power in the state. That Hamer was suspicious of the national Democratic Party was beside the point. The rural Mississippians made a cold-blooded calculation to offer Johnson their pledge of loyalty in order to claim their victory of pushing out the Dixiecrats. The drama nudged the Democrats further down the path of institutionalizing civil rights. The American political party is not a static body with a single platform, but a fluid “coalition of enemies,” to borrow from political scientists Gary Miller and Norman Schofield. This does not mean that the Freedom Democrats should have tolerated working with the Dixiecrats who denied them every bit of their humanity, and nor does it mean that the left today ought to capitulate to racism in the name of forging a working-class coalition. Instead, it suggests that movement groups should crowd the party, and become its dominant faction. A strategic embrace could afford the left control over platform, policy, and personnel. A final, key lesson we can take from Fannie Lou Hamer’s legacy lies in the powerful populist narrative she articulated of a multiracial working class. She envisioned an upward trajectory for poor blacks and whites that extended beyond equality: “I want the true democracy that’ll raise me and that white man up.” She was a strong proponent of both black empowerment and integration of the Mississippi Freedom Democratic Party. A poor black woman from rural Mississippi who led a movement of voter enfranchisement “embodied” the vision of extending America’s promise to the entire country, as Bob Moses put it. Her lived experience, coupled with her charisma and straight-talking personality, made her a trusted voice of both poor whites and poor blacks in Mississippi. In her mind, the movement was comprised not only of African-Americans seeking representation but “uncomfortables” in general—poor people without power, regardless of race. A populist insurrection today would do well to further Hamer’s conception of a multiracial community of “we the people” against a racist cadre of the ultrawealthy elite. Bayard Rustin described the Mississippi Freedom Democratic Party as the civil rights movement’s most innovative arm. Hamer and her delegates made “a conscious bid for political power” (emphasis his), jockeying for influence within the broad tent of the Democratic coalition. A strategic left today would continue the effort Hamer started. We need fewer nonprofits and more insurrections that beat down the doors of the Democratic coalition, while maintaining Hamer’s unflinching commitment to racial justice. Though the Republican Party in 2017 holds more legislative seats than ever, its coalition is too broad and too weak to sustain. Realignment is inevitable. A left that profits from it is not. 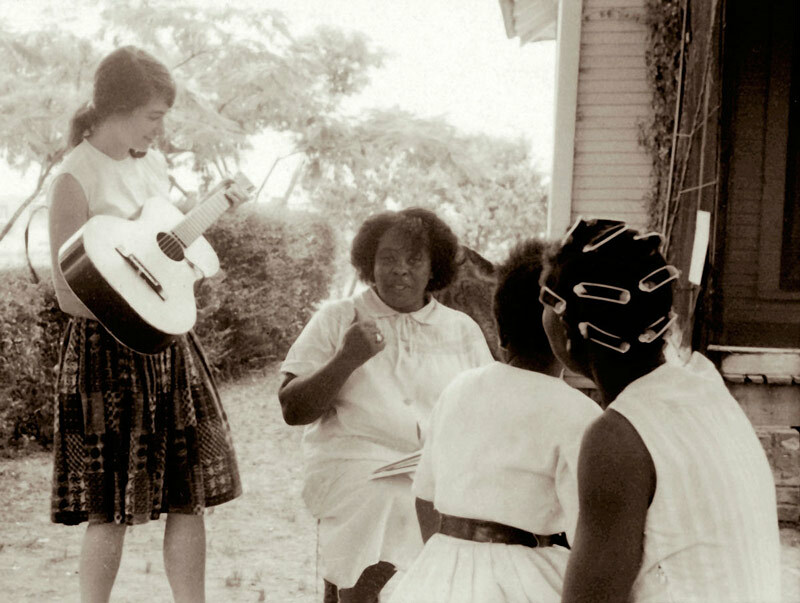 On the 100th birthday of Fannie Lou Hamer, as our fledgling People’s Alignment competes for power in a system long reluctant to cede it, we can take heart—follow the song of the poor black woman from Mississippi. Matthew Miles Goodrich is a writer and organizer living in Brooklyn. He serves as digital editor for Guernica and trains with the populist climate movement Sunrise. Follow him on Twitter @mmilesgoodrich. * With one exception: Louisiana went for Eisenhower in 1956.